E3 Editor's Choice: "Assassin's Creed: Brotherhood"
The on-going struggle between the assassins and templars has reached new heights. Ezio Auditore da Firenze is back and a little shaken up from his last encounters. However, he is still much wiser and deadlier than ever. “Assassin’s Creed: Brotherhood” continues exactly from where the “Assassin’s Creed II” left off. 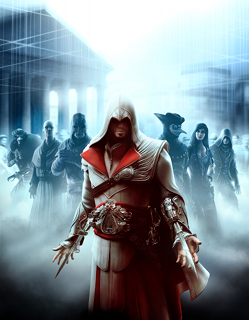 Ezio is still being hunted by the templars and still needs to defeat the evil that has inhabited Rome. But, this time around Ezio is armed with some fancy new abilities and weapons. Yes folks, we’ll be able to fire off a huge cannon and make it rain! However, it is imperative that we remember to stay on the offensive. The AI is definitely more aggressive in “Assassin’s Creed: Brotherhood”and you should use every ability in your arsenal to ensure that you take care of your enemies quickly. With a new game comes a new villain that is hellbent on destroying Ezio and his new brotherhood of assassins. New weaponry, machinery and foes; it appears to me like the campaign for “Assassin’s Creed: Brotherhood” is going to be nothing less than stellar. However, the really innovative portion of the game was showcased on E3’s show floor: the multiplayer. I was blown away by it. I was wondering how Ubisoft would be able to come up with a multiplayer experience that is unique to the “Assassin’s Creed” franchise but they were able to create something so unique that even someone who has never played an “Assassin’s Creed” game would be able to dive in and enjoy. That’s what truly made it my E3 Editor’s Choice. When, after playing one round of “Assassin’s Creed: Brotherhood”, my boyfriend couldn’t stop talking about his experience and how he’s actually thinking about getting the game. I thought to myself: this is the best of E3, hands down. Players are pitted against each other, armed with special abilities and a single assassination target. The objective is to kill as many targets as possible. The rub is that while you are hurting your target, there are other players that are targeting you as well. You must then hunt around the town looking for your target amongst a sea of similar looking AI. Using your radar as a guide, you’ll be able to find your target but remember to run when instructed to or else that could lead to your demise. But also pay close attention to the person you’re about to assassinate because if you accidentally kill a civilian then you lose your target and will be assigned a new assassination target. “Assassin’s Creed: Brotherhood” is definitely something I’m looking forward to. The game is set to hit stores on November 16th, 2010 for Xbox, PS3 and PC. © 2010 Ubisoft Entertainment. All Rights Reserved. Assassin’s Creed, Ubisoft and the Ubisoft logo are trademarks of Ubisoft Entertainment in the U.S. and/or other countries..”PlayStation” is a registered trademark of Sony Computer Entertainment Inc. Microsoft, Xbox, Xbox 360, Xbox LIVE, and the Xbox logos are trademarks of the Microsoft group of companies and are used under license from Microsoft. Software platform logo (TM and ©) EMA 2006.